The Miami Dolphins selected Ohio State inside linebacker Raekwon McMillan with the 54th overall selection in the NFL draft Friday. There are questions about McMillan’s ability to play as a three-down linebacker; although he excelled against the run, he did not stand out when he dropped back into coverage at Ohio State. While McMillan’s run-stop percentage of 11.1 percent ranked just 24th among inside linebackers in this year’s class, he recorded the 11th-most run stops in the class in 2016 with 42. However, McMillan has somewhat struggled in coverage as he allowed a completion percentage of 80.0 percent and a passer rating of 111.3 in coverage. 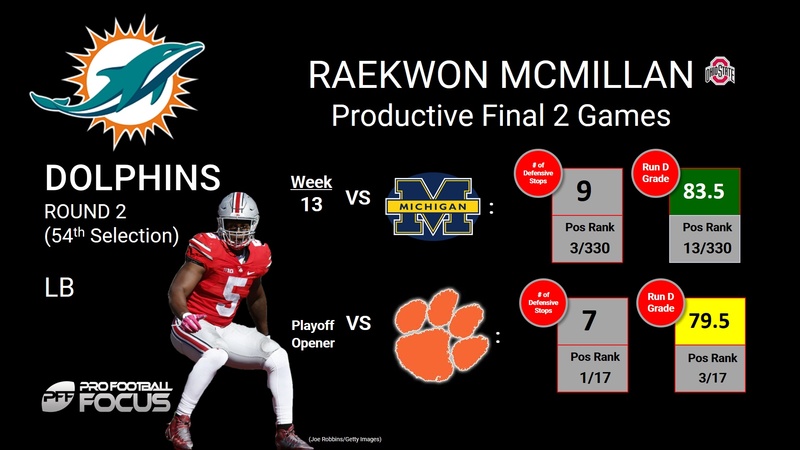 Overall, even if McMillan’s just a two-down linebacker with good instincts defending the run, he can present an upgrade for the Miami defense since Kiko Alonso ranked 48th in the NFL last season in run-stop percentage with 6.6, while Donald Butler was the 56th out of 60 inside linebackers with a run-stop percentage of 4.7 percent.